On Monday, May 16th, 2011 a dozen people created a disruption at the Greek consulate in downtown Montreal located at 1002 Sherbrooke West on the 26th floor. We entered the office chanting slogans of solidarity to anarchists and immigrants facing heavy repression at the hands of the Greek state and organized fascists. Furniture and plants were overturned and hundreds of fliers were scattered. One office employee attempted to detain a comrade but failed. 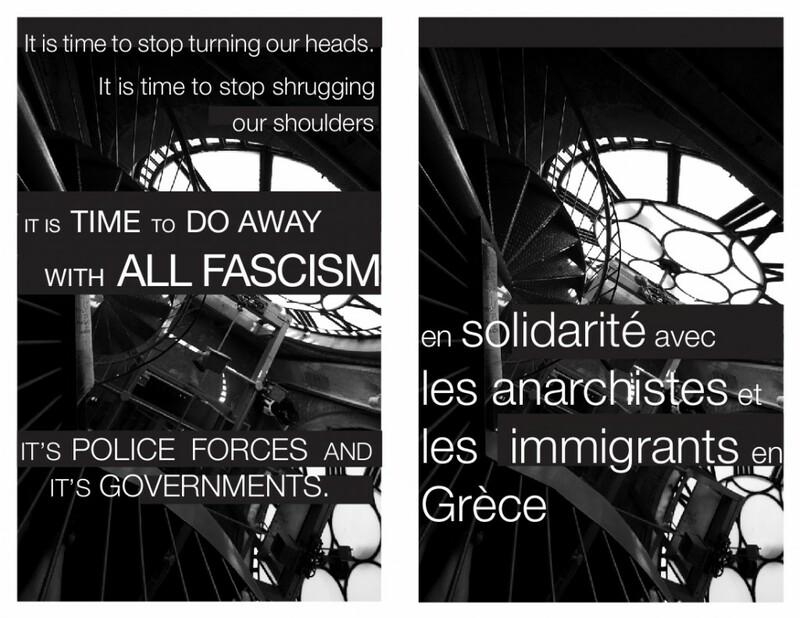 Outside people displayed a banner stating “(A) Flics-Porcs-Assassins, Solidarité contre la reprèssion d’État en Grèce” and handed out fliers. The call for international solidarity.